​Summer is starting to wrap up here in the Colorado Rockies. The aspens are turning color and we’ve managed to have a few scattered dustings of snow on the mountains, which leaves one inevitably daydreaming about the coming winter season. Rather than sit around waiting for the proverbial winter pot to boil, I figured this might be as good a time as any to sit down and write a review of HQ4’s latest snowkite: the MONTANA X.
I’ve spent close to a year on the Montana now, and feel like I’ve gotten to know the kite pretty well. It’s been a faithful companion on everything ranging from expeditions across snowy plateaus and mountain climbs up 12,000+ ft peaks, as well as some leisurely landboarding, and kite buggying. With all that said, the new Montana has surpassed my expectations and earned a reputation as my favorite foil kite to date. Its smooth flight characteristics and huge depower range have added a degree of trust to my personal riding that’ve allowed me to go further and explore more places than before – in conditions I previously would not have felt comfortable in. So kudos to HQ4 for making a truly great design on its 10th anniversary edition. It really is a phenomenal kite. ​For the past few generations, the Montana has typically favored a higher Aspect Ratio and more pronounced arc-shape than other kites in its class. The newest Montana is no exception. This higher AR results in a fast, efficient wing with excellent lift and hangtime. The higher arc means that there is not a lot of skidding or pin-wheeling in the turn, but rather it’s more of a clean carve with consistent continuous power. The pack has plenty of space for backcountry excursions. The HQ4 One Bar (sold separately) uses a Front Line Flag-out Safety (FLS). A short red line runs from one of the front lines to the center of the chicken loop, where you attach your kite leash. The primary safety is engaged by throwing the chicken loop which flags out the kite; to fully ditch the kite you’ll then activate your kite leash. Trim/depower works via a standard clamcleat arrangement. Perhaps the nicest feature of the bar in my opinion is the Chicken Loop, which is very easy to engage and disengage. As a result, I find myself activating it regularly for things like directly hooking into my Ride Engine slider harness. This has the added benefit of training your muscle memory to release the kite if and when you will need to engage the primary safety. ​For 95% of your landings, simply pulling the brake handle is all you need to do. In fact, I can’t remember a time this last winter when I actually needed to engage the safety. For lighter winds, a gentle pull on the brake handle will allow you to neatly steer the kite to the ground. In higher winds, a firm pull on the brake lines will cause wingtips to fold and it will come down with very little power– much less power than a closed cell kite like the Matrixx. Because the Montana has so many inlets, relaunching after pulling the brake handle aggressively is typically very easy. Just give the front lines a little nudge, get a couple of the inlets exposed, and it will pop right back open. Sometimes a little pressure on the back lines might be required to get the tips to pop back out. Both Landing and reverse launching with the brake handle are straightforward and uneventful. For reverse launching the kite, pull the brake handle a bit, back the kite up into the sky, release the handle and use the quick turn of the kite get it turned around and sailing upward. Easy. ​Since I couldn’t remember ever using the safety on the Montana X, I went out and tried it a few times for the purposes of this write-up. And made a video. Flagging out the kite does a very good job of getting rid of the power. The majority of times I was able to relaunch the kite after deployment with no issues, although using a FLS type system on a foil kite can sometimes result in the mixer pulleys getting tangled in the bridle lines. With the sheathed lines of the Montana, bridle tangles are less common and I never had any real big issues. There were a couple of times where I had to walk up to the kite and reset it. ​I think the system works well for its intended use as a safety feature when you really need to dump all the power. I personally prefer the simplicity and cleanliness of the FLS safety over 5th line systems that have an extra line running up to the kite that can wrap around your other lines. I guess you’ve gotta decide for yourself whether the occasional bridle tangle in the release of a front-line safety (that you rarely use) is more annoying and/or dangerous than the occasional tangle of a 5th line around your other lines (that you use all the time). ​The reality is that I think you’ll find you rarely use the safety on the Montana X since the brake handle works so well to kill the power and land the kite in all but the most extreme circumstances. In a word, build quality is excellent. HQ4 uses a combination of 20D and 30D fabrics on the Montana X. This has the benefit of keeping the kites very light – comparable to the ultralight versions of other manufacturers. Selective use of thicker fabrics optimize strength in stress areas where it is needed most. Actual kite weights range from 1.45 kg for the 8m to 2.25 kg for the 14m (the HQ4 One bar adds an additional 875g). They pack up super small: as an example I was able to fit an 8m Montana X and a 15m Matrixx III into my carry-on backpack for an airline flight this last winter. And I’m not talking my overhead carry-on bag, I’m talking the backpack I put under my seat with my laptop. So for the guy who plans on travelling a lot, its something to consider. Bridles and mixers are what you’d expect from a high end kite: Ronstan pulleys and sheathed bridle lines are designed for the higher abuse that mountain flying has to offer. The kite does not use any sort of leading edge stiffeners, which from a maintenance/durability perspective is a benefit (see my “Stability” section if you’re interested in a discussion about LE stiffeners and performance). There isn’t really a whole lot more to say about build quality other than HQ4 really has stepped up their game in recent years and I expect these kites to hold up and fly well for a long time. In the air the kite looks super tight with very little bulging between ribs. Once in the air, the attention to detail and build quality become self-evident in the handling qualities, which I will discuss next. So now on to the stuff we really care about. Once in the air, the kite shines. As a frame of reference, I’ll compare it to the Montana IX. The M9 was a fun kite that I personally always felt had more of a freestyle vibe to it. I likened the Montana 9 to a Porsche: quick turning and precise with a pretty stiff suspension and direct handling. The aggressive pop and lift of the kite might have caught some with less experience by surprise. ​When I flew the Montana X for the 1st time, I could immediately tell it was something different. It was still quick – very quick – but everything just felt smoothed out. It seemed to cut through the gusts better. And it seemed to be happy wherever you put it, no matter how fast or aggressively you put it there. 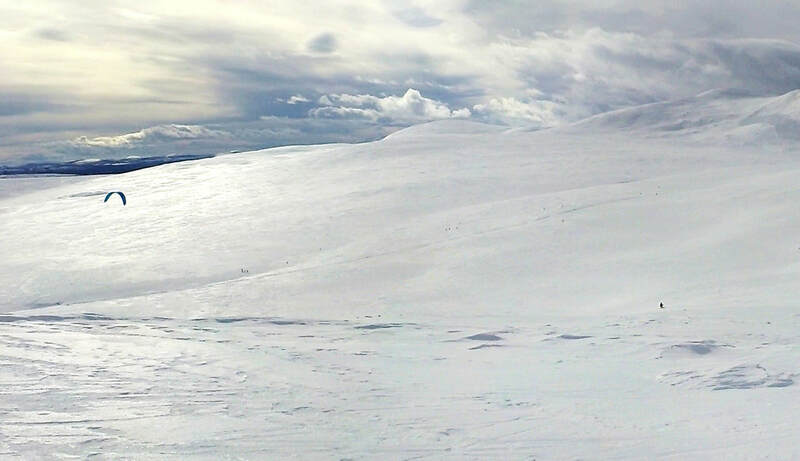 When I finally had the chance to go snowkiting for the 1st time, my initial feelings were confirmed. You could fly the kite entirely hands-off and it would just stay neutral to the side where you put it, neither dropping nor rising. 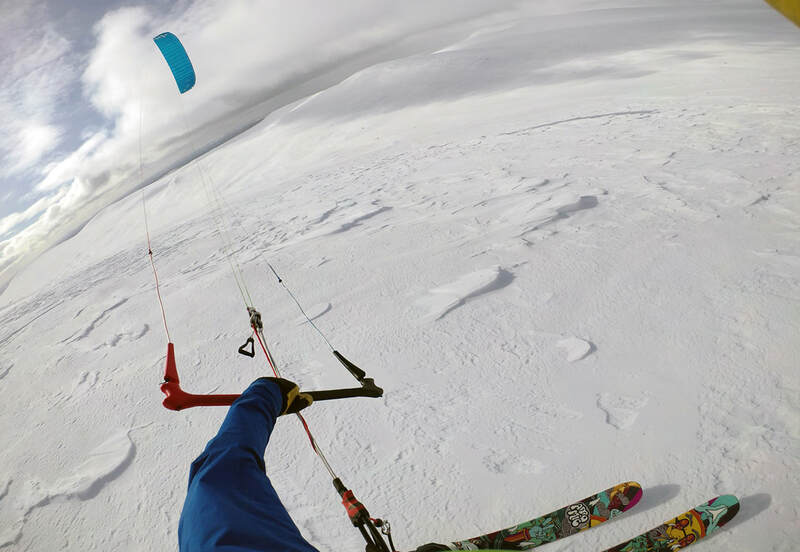 While cranking up slopes, the kite makes nice carving loops that hold continuous power. In gusty conditions the kite is well mannered and is less prone to collapse than the Montana IX. Tip tucking is rare-to-nonexistent, and there is little to no tendency for the kite to frontal-collapse when fully depowered even if flown quickly to the edge of the wind window. Over-the-bar steering behavior is excellent: you can be super aggressive with over-steering and the kite is extremely resistant to any sort of stall, collapse or tip tuck. This is great for when you're working a really tight notch up a mountain, or just need to make a quick ground save - you can be confident that the kite won't get wonky. ​This last winter I quickly learned one of the best improvements was in the kite’s ability to depower. While this might seem like a minor point, the benefits became profoundly apparent once in the mountains. Between this and the better stability of the kite, I found myself pushing further up slopes in stronger, gustier wind than in the past – simply because I felt more secure and knew once I got to the top the kite was going to depower well and allow me to descend without being lofted inadvertently. On mountain descents, you can just park the kite to your side and almost forget about it. These two attributes: stability and depower - really have been a game-changer for me and my personal riding. Because the kite has a relatively thin airfoil and higher aspect ratio, speed and upwind ability are superb. In fact, Italian rider Andrea Di Lisa used a combination of the Montana X and Zeekai to secure a podium finish in the IKA World Cup Mens Ski Racing Category this last winter – 2nd only to the venerable Felix Kersten and competing with some much more race-oriented kites. While the Montana X wasn't designed as a race kite, it does like to run and is fun to let loose on open fields or frozen lakes. With its light weight materials and high number of leading edge inlets, the Montana X is very quick to inflate and excels at light wind riding. While the low end grunt of the Montana X is going to be less than the Montana IX, the smooth power delivery and speed make up for it. And while the pop is also not going to be as aggressive, the hangtime of the kite seems to just go and go. While in Sweden, I got to witness Lolo Sublet doing some hill glides with the 12m on the day we explored the Norway side of the mountains. I also had a spring mountain session here in CO on the 12m where the winds were quite light, but holy cow was I getting some extended jumps that bordered on being hill soaring. And the landings are just so soft. Even the 8m in its appropriate wind range has some great hangtime and float and will never drop you. Really super fun kites to jump with. 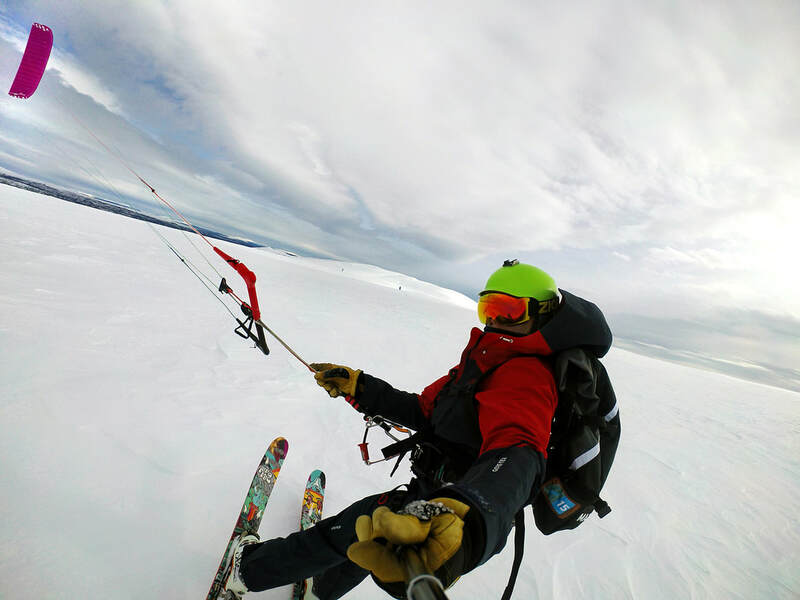 ​For back country snowkiting the 8 and 12m make a nice combination. In the mountains, the 12m really is all you need for light winds and the smaller size vs the 14m will allow you to get a little tighter turn for winding up the slopes. The 8m makes an excellent higher wind kite: super tight turn radius and dumps power welI when things get a little more helter-skelter. One day in particular I had a great time on the 8m in the mountains when in the past I would have probably been on my 5.5m Apex. As mentioned previously, stability stands out as a strong point for the Montana X; it is the best I’ve personally ridden in this kite category. The kite sits pretty far forward in the wind window, but is still solid and doesn’t exhibit overshooting tendencies. HQ4 has purposefully chosen not to use leading edge stiffeners/formers as they believe not having them them gives the kite some inherent stability. The reasoning is that as the kite reaches very low angles of attack near the edge of the wind window, an unstiffened leading edge will deform slightly, reducing aerodynamic efficiency and thus preventing it from overshooting. The lack of stiffners also makes the kite lighter, easier to pack and less prone to maintenance/abrasion issues. Regardless of your feelings about LE stiffeners, the fact is that the Montana X design works. In the mountains, the kite is confidence-inspiring. I’ve had the 8m in some pretty gnarly winds up on Hoosier Pass, and it handled them like a champ. At that particular spot, the winds tend to roll in over a hillside, leaving you to ascend with the kite at the edge of the wind window in gusty, slightly rotoring winds. The kite handled these conditions exceptionally well. Any time you’re flying in rotors, you’re going to get schwacked. A key discovery and observation for me was that the few times the kite did collapse, the smooth control and excellent depower made for uneventful recoveries. Whereas in the past I would have been pretty concerned about a kite unfurling in the middle of the power zone and surging disastrously, with the Montana X I felt confident sorting things out with the kite still in the air and flying away without feeling overwhelmed or in danger. That’s been another huge asset to me and a further confidence booster. So anyone who knows me knows I’ve been a big fan of the Matrixx for some time, the latest HQ4 Matrixx being no exception. This summer I would say easily over 80% of all my water riding was done on the Matrixx, even though I have inflatable options available. I just like the feel of foils, and the Matrixx in particular. With that said, I think HQ4 has outdone themselves with the Montana X. While the differences are subtle, they are certainly different kites. The differences are primarily born out of the fact that the Montana has a leaner airfoil and slightly higher Aspect Ratio than the Matrixx. This translates into a wing that is a bit faster and more efficient with better upwind ability. The Montana is going to have a quicker turn and better depower, while I believe the Matrixx might have a bit more low end grunt. I've found that the Montana handles sharp gusts better, likely also due to its leaner airfoil and better overall depower. Other things to consider are that the Montana has sheathed bridle lines whereas the Matrixx does not. So the Montana lines are going to stick up to accidental snags a little better and the Montana seems less prone to bridle tangles. I would say that if you’re a person that does not plan on using their kite on the water, I would personally choose the Montana. If you do plan on water kiting, the Matrixx is still the obvious choice and will not disappoint. You’d be amazed at what you can cover on a 9/15 Matrixx Combo. ​Speaking of the 9 and 15 Matrixx, let me just do a quick comparison between the 8 and 14m Montana vs 9m and 15m Matrixx, since these are sizes folks will likely be trying to choose between. The 14m Montana X and 15m Matrixx III compare very similarly to each other in terms of power and wind range. In fact the wingspan of the 14m Montana is slightly longer than the 15m Matrixx. And since the 15m Matrixx is built out of 20D material only, it is actually slightly lighter (2.17 vs 2.25 kg). I had one day when I was on the 14 and a buddy was on the 15; conditions ran the gamut from light to strong and I didn’t sense either of us had a significant advantage one way or the other. The Montana is a bit quicker turning with a bit more depower. Probably the biggest advantage the 14m Montana had was easier and more manageable landings at the top of the wind range. ​The power difference between the 8m Montana and 9m Matrixx is much more noticeable, however. The 9m is a pretty powerful 9 – I’ve had onlookers and other kiters say as much – and laying the kites over each other will show that the 9 is measurably larger. The 8m Montana is going to depower quite a bit more and I found this in conjunction with the leaner airfoil was less prone to loft you in sharp gusts over the 9m Matrixx. So if you know you’re going to be at the higher wind limits and gustier conditions, I would personally would choose the Montana. ​Otherwise, I will say that the 9m Matrixx is a crazy fun kite – really quick and powerful with some great floating jumps. I had some ridiculously fun sessions on the water with it this summer touring Lake McConaughy. On their 10th anniversary addition of the Montana, HQ4 has delivered something special. The lift and hangtime will keep intermediate and advanced kiters grinning while they push their personal limits, and the stability and manners of the kite will keep them safe while they’re doing it. It is good-natured kite that inspires confidence and is just stinking fun to fly. 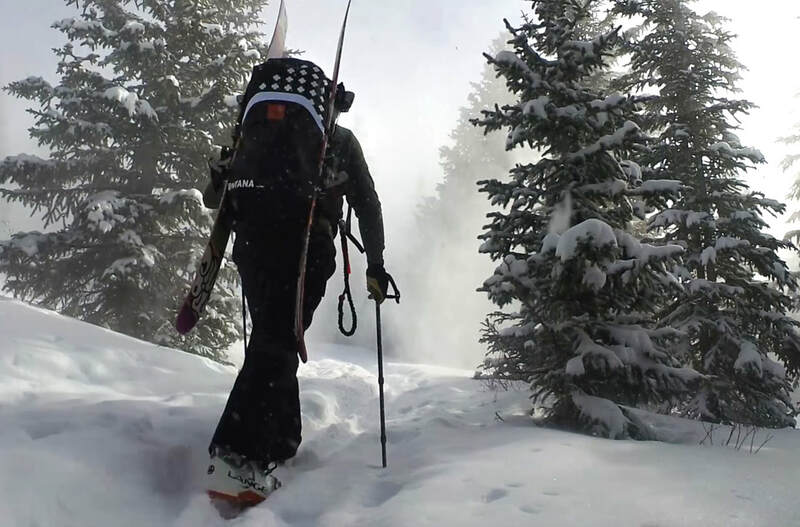 While the design seems focused on making the consummate backcountry snowkite, these same characteristics also ensure a kite that is quick, light, easy to handle and well-behaved - suitable for pretty much any kite discipline you could think of. From buggying, landboarding, or just cruising on an open field, it’s going to be fun. I’ve also given the 8m to beginners in lighter winds and they were having good success on it, you just need to remember that there is a lot of lift there if you ask for it. In the end, I've come away feeling like the the power of the Montana X is in its compliments and subtleties. There isn't any one performance trait that shouts or demands attention above the others. Rather its the finely tuned synergy of all the characteristics that make it such a great kite. It feels like a kite that was designed for something larger than itself - to be a natural extension of the kiter and to facilitate his/her dreams and visions. Like the chisel is to the sculptor, the Montana feels like a well-crafted tool for etching out and making real the mind's dreams and adventures. It encapsulates that feeling of freedom, confidence and exploration that many of us are looking for. And while we may still have a few more days to wait for the snow to drop, I look forward to being out there whooping it up with some of you this coming winter season!